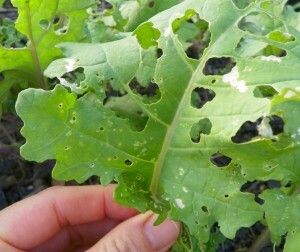 Caterpillars can be a major pest of fall vegetables, particularly cabbage, kale, collards, broccoli, and cauliflower. Seedlings and young plants may be killed by caterpillar feeding if left untreated. Caterpillars are easily controlled in vegetable gardens, especially when detected early. In addition to non chemical methods, insecticides are available for control, including several organic products. Caterpillars, also referred to as worms, are the immature life stage of butterflies and moths. Most of the caterpillars that are pests of vegetable crops are moth caterpillars. For caterpillars to infest your garden, a moth must first fly in and lay eggs on your plants. Eggs may be laid singly or in clusters. A small caterpillar will hatch from each egg a few days later. As caterpillars feed, they grow larger and often change color. Most caterpillars feed for two to three weeks, and then enter a cocoon. Depending on the type of caterpillar, they may remain in the cocoon through the winter or emerge this fall as a moth and lay more eggs. Caterpillars are easy to detect by the ragged holes their feeding activity leaves in plant foliage. If you notice holes in the leaves of your crops, be sure to check for caterpillars both on the top and backside of plant leaves. For healthy, established perennials, trees, and shrubs, losing a portion of their leaves is not a problem. In vegetable gardens feeding damage is more serious since young plants can easily be killed and missing leaves mean less produce. Plus, who wants to eat caterpillars with their cabbage? 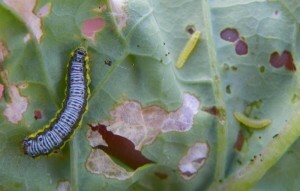 Cross striped cabbage worms feed on vegetables in the cabbage family. One of the simplest methods for controlling caterpillars is to pick them off plants and drop them into a bucket of soapy water or squish them. This takes a bit of time and may not be everyone’s cup of tea. Another option is to cover crops with insect barrier fabrics (for example, this product sold by Johnny’s Seed: http://www.johnnyseeds.com/p-5456-agribon-ag-15-insect-barrier-118-x-250.aspx). The fabrics form a barrier, keeping moths from landing on crops and laying eggs in the first place. Since most fall vegetables are grown for their leaves or their roots and do not require pollination, covering them with fabrics does not reduce yields. Another way to control caterpillars is to spray infested plants with an appropriate insect control product. Products containing organic and synthetic active ingredients are available from local garden centers. When applying any pesticide be sure to read and follow all label directions and pay careful attention to the pre harvest interval. This is the number of days you must wait between the time you spray the plant and the time you harvest. Pre harvest intervals vary among insecticides from 0 to 21 days or more. If you plan to harvest soon, be sure to choose a product with a short pre harvest interval. Organic insecticides that control caterpillars include those containing Bacillus thuringiensis, a bacterial disease that only controls caterpillars and is commonly referred to as B.t. B.t. is sold as Dipel, Thuricide, and several other brand names, and is most effective if applied when caterpillars are small. Spinosad is another option for controlling caterpillars organically. Derived from a soil dwelling bacterium, spinosad is the active ingredient in several insecticides, including Captain Jack’s Dead Bug Brew and Greenlight Spinosad Lawn and Garden Spray. Other organic pesticides are derived from plants. Pyrethrin is extracted from the flowers of certain species of chrysanthemum, though not the type we commonly grow for their fall flowers. Pyrethrin will help control a wide range of insect pests, including caterpillars. Neem oil is derived from the seeds of the neem tree, a native of southern Asia. It is effective for treating several common pest insects including caterpillars, aphids, true bugs, and some beetles. Some of the advantages of using organic pesticides are that they are less harmful to beneficial insects and break down quickly, so do not leave behind long lived residues. This is also their main drawback. Because organic pesticides break down quickly, usually within a few days of being applied, they must be reapplied often to provide ongoing plant protection. Check product labeling for application timing recommendations and restrictions. Many of the synthetic pesticides available today are manmade versions of pyrethrin. Known as synthetic pyrethroids, this group of insecticides includes those with the active ingredients bifenthrin, permethrin, cyfluthrin, and cyhalothrin. Older insecticides that control caterpillars include Sevin and malathion. Active ingredients of all pesticides are listed on the product container and can usually be found on the front of the packaging. When treating edible plants, be sure to only use products that are labeled for spraying vegetables. To minimize impact to bees and other pollinators, spray late in the evening and never spray open flowers or plants that bees are actively visiting. Please note: Recommendations for the use of agricultural chemicals are included in this article as a convenience to the reader. The use of brand names and any mention or listing of commercial products or services in this publication does not imply endorsement by North Carolina Cooperative Extension nor discrimination against similar products or services not mentioned. Individuals who use pesticides are responsible for ensuring that the intended use complies with current regulations and conforms to the product label. Be sure to obtain current information about usage regulations and examine a current product label before applying any chemical. For assistance, contact your county Cooperative Extension agent. Visit your local Cooperative Extension office to learn more about gardening and landscape care. Go to https://www.ces.ncsu.edu/local-county-center/ to find your county Extension center or post your questions to be answered online via Extension’s ‘Ask an Expert’ widget. • Which Fertilizer Is Best?